The best engine sludge remover I've found by far. It's quick, safe, and cheap. The best part is it cleans as-you- drive - instead of having to take your motor apart to do so. The best engine sludge remover I've found. Mega Power's Best Engine Sludge Remover. Safe to use while driving. Won't let sludge resettle. Gets your car, diesel truck, machine working great and clean again in no time. Mega Power's Engine Sludge Remover. Their method is the best way to get your dirty motor problem-causing residues out and motor running great again! And it an't harm your motor like part store and quik lube flushes may! With it you're back on the road again trouble-free the same day because its ingredients clean, free, lube, and protect during the sludge removal. A great tune up like response is your evidence of its cleaning success. Steps to using the best engine sludge remover method. 2 Steps to using the best engine sludge removal Treatment product. Using the best engine sludge remover product is to follow the simple 2 step install and let the products complex ingredients - 6 of them, to restore your motor's clean operating state. Step One: is to add 3 items marked to your gas tank and motor oil. These: Clean. Free stuck parts. Start healing, conditioning damage surfaces. Advantages no other product claims! Chances are both your car "motors" - and not just this motor, but all your motors and transmissions need this cleaning and anti-wear conditioning advantages, to clean protect and promote their clean zippy life - with Mega Power. Mega Power also exceeds the recommended every 2 year new car warranty service recommendations for engines and transmissions. One Mega Power Best Engine Sludge Remover Treatment. Includes 6 items shown. Easy-to-follow directions. Satisfaction Guarantee. Phone help if needed. Shipped to your door by FedEx in 3 days. Just $75 plus $15s&h= $90 total. Order Two Mega Power Engine Sludge Remover Treatments: For 2 cars: 12 items. Keep both your cars healthy - as your restore this cars health - using the same products and tips. Just $130 total for 2 motor treatments. 12 items. Plus $15s&h= $145 total. Save $35. Order one Mega Power Engine [$90]and Transmission [$75] Treatments. Includes 9 items. Easy-to-follow directions. Guarantee. Shipped to your door by FedEx in 3 days. Phone help, if needed. 9 items. Just $120 plus $15s&h= $135 total. Save $30. Transmission service items not shown. What makes Mega Power the Best Engine Sludge Remover? We recommend Mega Power for its research to find and offer the world's best engine transmission cleaners - an anti-wear, and anti-friction modifying ingredients to get troubles vehicles going faster, better, and a lot more economically. Anyone, not just mechanics can use. Because Mega Power has a friction-modifier ingredient that cleans, lubes, and protects where sludge is blocking you motor's oil to each part! That's its engine saving, cleaning advantages you need for your engine. This review cover the Mega Power Sludge Remover Treatment. it's the one that I recommend and reviewed here. The products picture, the easy install Directions, guarantee, and ordering info are below. It's sludge removal method is easy, and results are amazing, fast, and guaranteed to please! How is it that results will be amazing? Mega Power's success to work in as little as 15 minutes is its ability to crawl into tight places to clean, free, and lube where oil cannot go. Because the combustion-side piston rings, valves, sensors, and fuel injectors get the overfill of sludge - Mega Power cleans those top of your engine items, from the gas tank to injectors, combustion area rings and valves, to start the sludge removal process. Mega Power next adds a powerful anti-wear lubricant that goes where oil can't, to lubricate sludge covered pistons bearings valves lifters and gears. The special lube aid is called MC+. MC+ begins the healing freeing process. Cleaning oil delivery lines and the oil pump is next, an its oil pick-up screen, to restore full oil pressure through-out your motor. Valve stems are cleaned and freed - to end their sluggish way and close faster - one of the 6 ways power is restored. Valve lifters are cleaned, removing sludge blocking oil to them. This stops their noisy tapping. Ending that worry, for you also. Liquefied sludge is removed during an oil change with one of the products. New oil is added to the cleaned engine. Then Mega Power adds anti-wear to smooth wear-roughen, pistons, bearings, valves and gears - This slams the brakes on rapid wear-out - and further cleaning continues any sludge removal needed and fills your oil filter. This process get your motor running clean and running great, quickly again. That's what works and what you should order for your motor! Order Mega Power below. You need Mega Power for those reasons, and for this one, too!. That's the product your "motor" needs - not just this motor, but all your motors and transmissions need this cleaning and anti-wear, to assure an end to this problem, returning them back to their earlier clean zippy life with Mega Power. Transmissions service every 2 to 4 years. Engines every years- as engines are much dirtier and much hotter and need more help. That's what your "motors" needs - not just this motor, but all your motors and transmissions need this cleaning and anti-wear conditioning advantages to remove negatives for a clean zippy life - with Mega Power. One Mega Power's Best Engine Sludge Remover Treatment. Includes 6 items shown. Easy-to-follow directions. Satisfaction Guarantee. Shipped to your door by FedEx in 3 days. Phone help if needed. Just $75 plus $15s&h= $90 total. Order Two Mega Power Best Engine Sludge Remover Treatments: For 2 cars: 12 items. 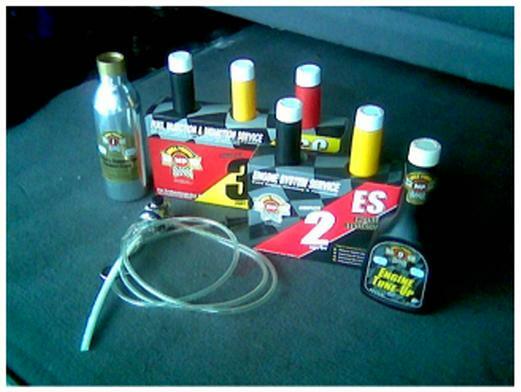 Keep both your cars healthy - as your restore this cars health - using the same products and tips. Just $130 total for 2 motor treatments. 12 items. Plus $15s&h= $145 total. Save $35. One additive company Mega Power, is providing new safe, Hi-tech chemical cleaners to clean all six areas - for about $250 if a mechanic does the install. Under $100 - if you do so. Its an easy product to install by any car owner. And before after results are impressive. See picture... Nothing to take apart - Mega Power does the cleaning as you drive! A factor all other sludge removing additives do not recommend. Mega Power removes sludge safely and neutralizes acids too: While your engine critical parts are cleaned and freed, Mega Power neutralizes acids ... a major sludge maker. Something no other flush product does! Mega Power opens clogged oil passageways: Having chemical cleaners, Mega Power uses them to dissolves the 6 different types of sludge for filtering out, and drain out at oil change removal. While 100% of sludge is not intended or needed to be removed, sludge that binds and restricts movement is guaranteed to be removed. This restores strong motor function - not sludge on non-moving surfaces. Mega Power restores your motors proper breathing: Breathing is restored by cleaning piston rings, dirty intake and exhaust valves, and several smog reducing components related to breathing. Like cleaning congested lungs.... helps you when ill.
Mega Power is a simple 2 step cleaning treatment for both top an bottom of your motor. It includes freeing and cleaning of your fuel system, combustion area, piston rings, and their valves, all sludge maker negatives. You want this product to do all that - and your budget may, also! Mega Power Best Engine Sludge Remover Treatment provides 3 conditioners. They heal, smooth, and protect worn, dirty surfaces after cleaning. You might say this is an extra life preserver function helping your engine to recover and gain years more service for you. Is that what you want? This quick 6 point education shows your motor needs the best sludge remover. That means Mega Power for more than sludge removal! Order Mega Power Now! Ordering Mega Power by selecting one of the specials above. Mega Power cleans an lowers blow-by 50% to 75% -the engines sludge maker. This is possible by cleaning and freeing your pistons 3 bracelet-like steel rings- when dirty, allow more combustion to slip pass the piston to mix an sludge your oil. Mega Power Conditioners not only clean, they heal wear roughen and damaged surfaces - a power-boosting, engine-revitalizing advantage that adds years more service life to your engine. See sludge removal demo video on this point. Compared to quick engine rinses - store sold common sludge removal flushes - that are often unsafe because they loosen sludge to fast an this plugs up small oil delivery passageways. Or, even the expense of $2000 taking your motor apart by a mechanic for cleaning is often not guaranteed. The Mega Power Engine Sludge Removing Treatment is safe, improves performance 3 ways, and it all happens as you drive in 2 easy steps an easy to follow directions given, sent to your door by FedEx in about 3 days. Comes with a 100% satisfaction or money back guarantee! Results are fast. Install is simple. Driving does the cleaning. Order now! Get on down the road of life trouble free again with Mega Power. One Mega Power Best Engine Sludge Remover Treatment. Includes 6 items shown. Easy-to-follow directions. Guarantee. Shipped to your door by FedEx in 3 days. Phone help, if needed. Just $75 plus $15s&h= $90 total.